Our approach with Twitter is to own the social engagement around this movement. Believe Entertainment Group (BE Group) today announced plans for “EpicEDM,” a new, ongoing original content series featuring top electronic dance music (EDM) artists, festivals and clubs worldwide that will be the first studio originated content series designed specifically for the Twitter platform. 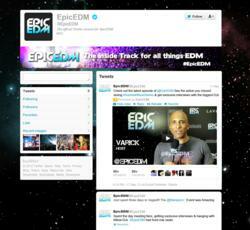 Financed by Believe Entertainment Group and executive produced by studio co-founders Dan Goodman and William H. Masterson III, EpicEDM is slated to premiere in late 2012, exclusively on Twitter. EpicEDM will be the inside source for all things EDM, from the artists and tours to the world’s most exclusive nightclubs and biggest music festivals. The new series will live at @EpicEDM along with a range of new content providing 24/7 EDM insider access. To host this new worldwide hub for EDM and premiere this original content series, Believe Entertainment Group will utilize Twitter’s entire Promoted Suite of products, including Twitter’s latest innovations, such as interest and geo targeting, allowing EpicEDM to showcase the best content and enable real-time conversations among EDM fans. A network of official partners, unofficial friends and user Tweets curated by EpicEDM will bring always-on programming including weekly in-studio video updates and exclusive artist interviews with some of the biggest DJs and producers in the world, access to pre and post-events, contests and ticket giveaways, daily news Tweets, video blogs, photos and more. Believe Entertainment Group is the New York-based independent digital studio behind the recent popular series In the Booth featuring legendary DJ/Producer Tiësto that premiered on YouTube with more than 70 million views in its first three months, and The LeBrons, with NBA champion LeBron James. The studio will launch a new lifestyle and entertainment news series with Jennifer Lopez, called Tiger Beat Entertainment, later this year. Believe Entertainment Group will finance and sell EpicEDM; additional details on advertiser partnerships for EpicEDM will be announced soon. Believe Entertainment Group is a digital entertainment company producing high profile content in partnership with elite talent and leading brands through a variety of digital outlets such as web, mobile, VOD, and social media. Believe Entertainment Group recently launched a new documentary-style show with legendary DJ/Producer Tiësto, called In the Booth (youtube.com/tiesto), and announced a new lifestyle and entertainment news series with Jennifer Lopez and Nuyorican Productions, entitled Tiger Beat Entertainment. In April 2011 the company launched The LeBrons, a new original, animated Web series with NBA champion and three-time league MVP, LeBron James and brand partners HP, Intel, Bing, Sprite and Nike, that premiered on YouTube (youtube.com/TheLeBrons) and was distributed through LeBron’s Facebook, Twitter, and a dedicated section of LeBronJames.com, with syndication through Digital Broadcasting Group (DBG). In 2010, Believe Entertainment Group formed an alliance with Paramount Digital Entertainment (PDE) working together on the hit digital series The Legion of Extraordinary Dancers (The LXD), created by Jon M. Chu (Step Up 2: The Streets and Step Up 3D) and distributed through Hulu; the company also expanded its partnership with MommyCast, the Webby Award winning multi-medium show for moms, and announced the launch of MommyCast Latina, a first-of-its-kind, original HD Web show specifically for the Latina mom. Dan Goodman and William H. Masterson III, co-founders of Believe Entertainment Group, have launched previous digital entertainment projects including Seth MacFarlane’s Cavalcade of Cartoon Comedy (youtube.com/sethcomedy) with Family Guy creator Seth MacFarlane and meinspace.com, an online effort to support Sacha Baron Cohen’s Bruno, as well as original short form content with the world famous improv troupe, The Second City among others. Their extensive experience in advertising and marketing has led to brand and distribution partnerships with well-known, respected brands such as Burger King, Coca-Cola, Nike, HP, Intel, Procter & Gamble, Priceline, Johnson & Johnson, State Farm and Microsoft among others, as well as key distribution relationships delivering scalable audiences for their projects including YouTube, Google, Hulu, Digital Broadcasting Group, Facebook, Twitter, iTunes, and more.